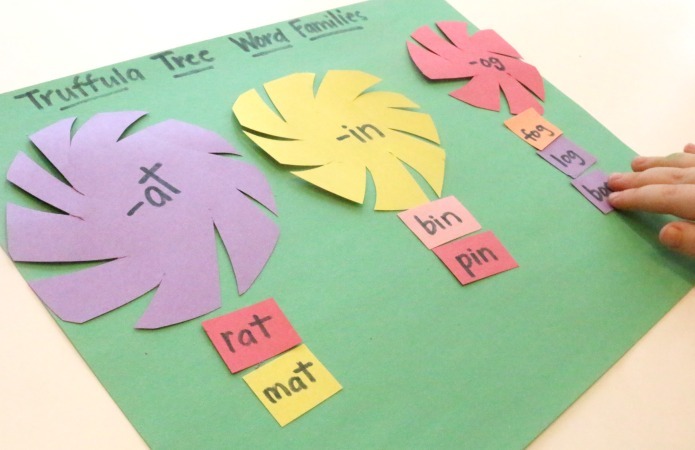 To practice sorting through word families and differentiating between letters and words with Little Sis, I set up a reading activity inspired by Dr. Seuss's The Lorax . Little Sis put together colorful Word Family Truffula Trees. 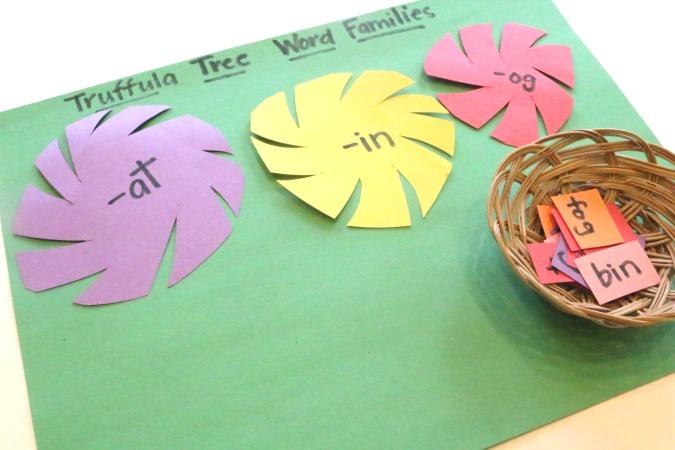 Here's how to set up this fun literacy activity for your beginning reader! To set up your activity, you'll need to do a little bit of prep work. Begin by cutting out your Truffula Trees. I chose purple, yellow, and red construction paper. Cut a circle from each color; to make the jagged edges cut triangles around the circles. For the trunks of the Truffula Trees I chose two colors for each tree so that Little Sis could work on patterning skills, and cut up several small rectangles. On each Truffula Tree puff I wrote a word family ending. On the squares that make up the trunk, I wrote a word from that word family. Alternatively, for beginning readers you could write a letter on the stem and have your child see if that letter plus the word family makes a real word. If so, glue the letter under the Truffula Tree to create the trunk. 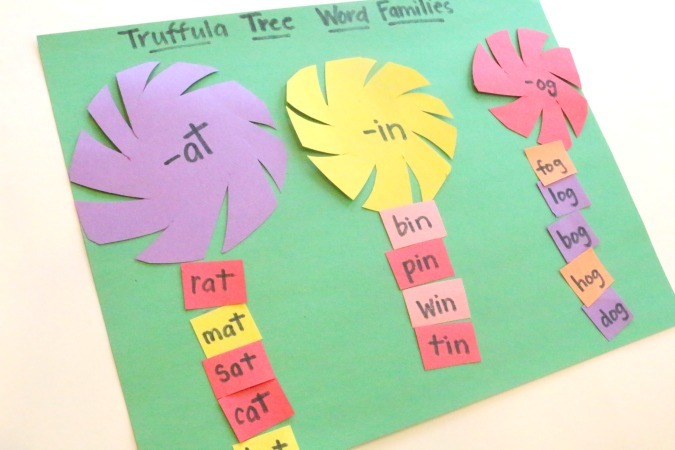 Begin this Dr.Seuss Inspired Literacy Activity by choosing a word and adding it to the correct Truffula Tree Word Family. 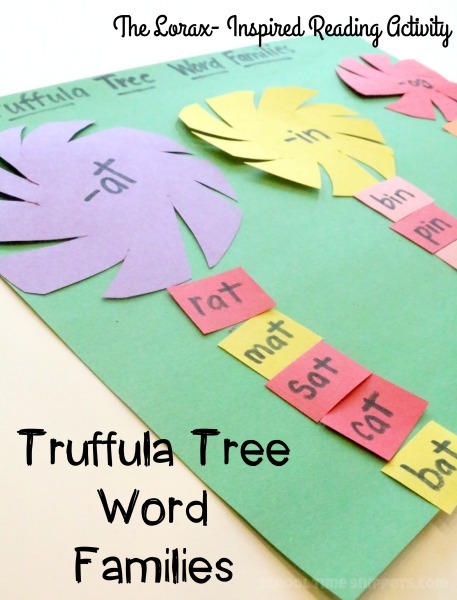 Glue the words underneath the Truffula Tree puff to create the trunk. 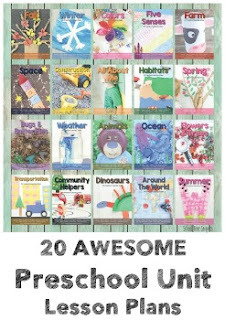 Once the words have been sorted out, work with your child to read each one! Hope you enjoy this fun and colorful way to explore word families with our Lorax Themed Reading Activity!